Ondine continues its series of works by Baltic composers with a new exciting release. This disc features Moorland Elegies, a 50-minute work for mixed choir and string orchestra by Estonian composer Tõnu Kõrvits (b. 1969). The work is being performed by the prestigious Estonian Philharmonic Chamber Choir and Tallinn Chamber Orchestra conducted by Risto Joost. 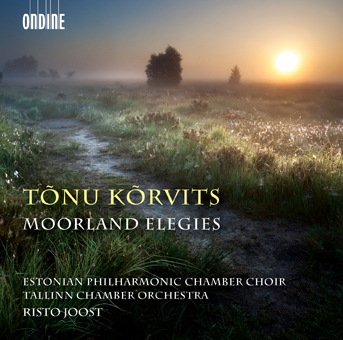 Moorland Elegies (2015), a nine-part cycle for mixed choir and string orchestra, is a crowning achievement of its composer Tõnu Kõrvits’s magical impressionism. The work was premiered by the Estonian Philharmonic Chamber Choir and the Tallinn Chamber Orchestra at Tallinn’s St. John’s Church on 31 October 2015, conducted by Risto Joost. The cycle is shaped and animated by its texts: a selection of poems by the English author Emily Brontë (1818–1848). “Moorland Elegies is a journey into the darkest, most mysterious corners of loneliness: to where one doesn’t dare to peek twice,” Kõrvits has commented. The selection of poetry in Moorland Elegies contains bright, sorrowful, dramatic, and divine scenes that form no coherent plot. There are only spiritual conditions characterized by a certain poetical abstraction, which develop through natural imagery and spatial impressions. Risto Joost is the chief conductor of the Tallinn Chamber Orchestra and received in 2016 the Music Prize of the Estonian Cultural Endowment. Estonian Philharmonic Chamber Choir, founded in 1981, has cooperated with some of the most well-known conductors and orchestras around the world and has won numerous awards in recent years, including 15 Grammy nominations. This is the choir’s sixth recording for Ondine.